NASA's Dawn mission has found evidence for organic material on Ceres, a dwarf planet and the largest body in the main asteroid belt between Mars and Jupiter. Scientists using the spacecraft's visible and infrared mapping spectrometer (VIR) detected the material in and around a northern-hemisphere crater called Ernutet. Organic molecules are interesting to scientists because they are necessary, though not sufficient, components of life on Earth. crater where organic concentrations have been discovered (“a” through “f”). warmer colors indicating the highest concentrations. Ceres reclining on a cotton bale on a 1861 $10 CSA banknote. Highly resolved images of Occator crater show evidence for long-lasting geologic activity. Among the most striking features on the surface of Ceres are the bright spots in the center of Occator crater which stood out already as NASA’s space probe Dawn approached the dwarf planet. Scientists under the leadership of the Max Planck Institute for Solar System Research (MPS) have now for the first time determined the age of this bright material, which consists mainly of deposits of special mineral salts. With about four million years only, these deposits are about 30 million years younger than the crater itself. This, as well as the distribution and nature of the bright material within the crater, suggests that Occator crater has been the scene of eruptive outbursts of subsurface brine over a long period and until almost recently. 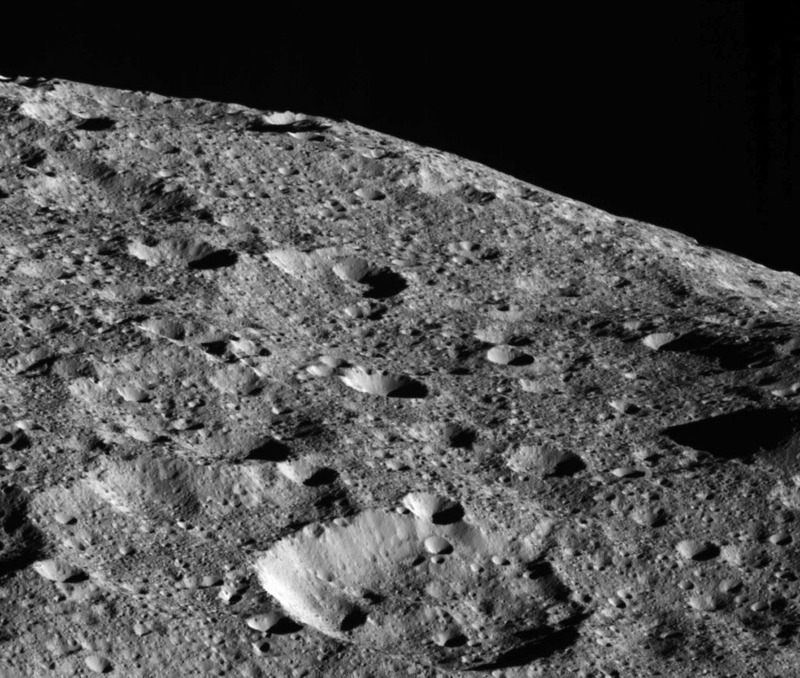 Ceres is thus the body closest to the Sun that shows cryovolcanic activity. For nearly two years, the NASA’s space probe Dawn has been accompanying dwarf planet Ceres, which orbits the Sun within the asteroid belt between Mars and Jupiter. During the first part of the mission, the probe advanced to lower and lower orbits until between December 2015 and September 2016 only approximately 375 kilometers separated it from the surface. 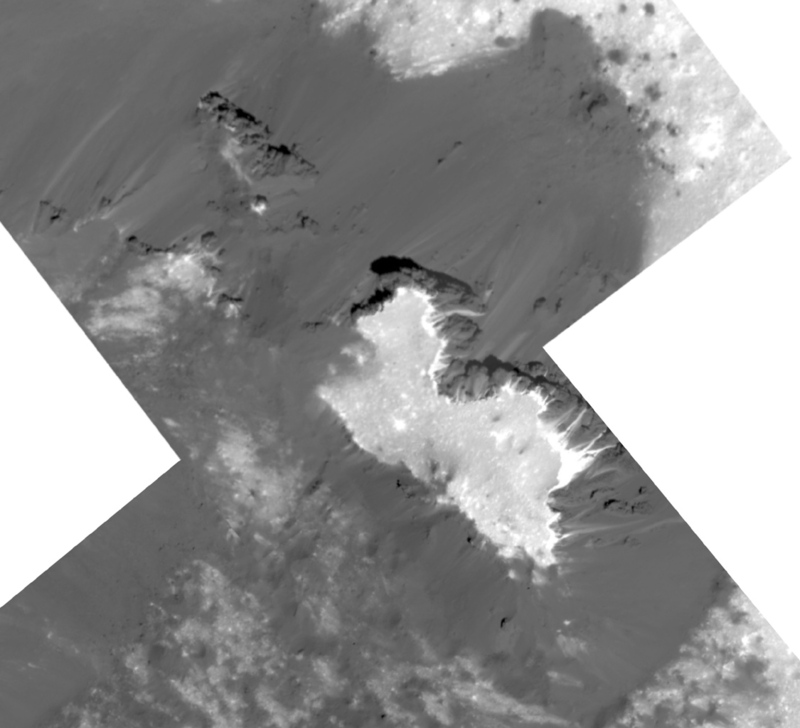 During this so-called Low Altitude Mapping Orbit the Dawn Framing Cameras produced highly resolved images of Ceres’ surface displaying a resolution of 35 meters per pixel. The Dawn Framing Cameras, Dawn’s scientific imaging system, were developed and built and are operated under the leadership of the MPS. 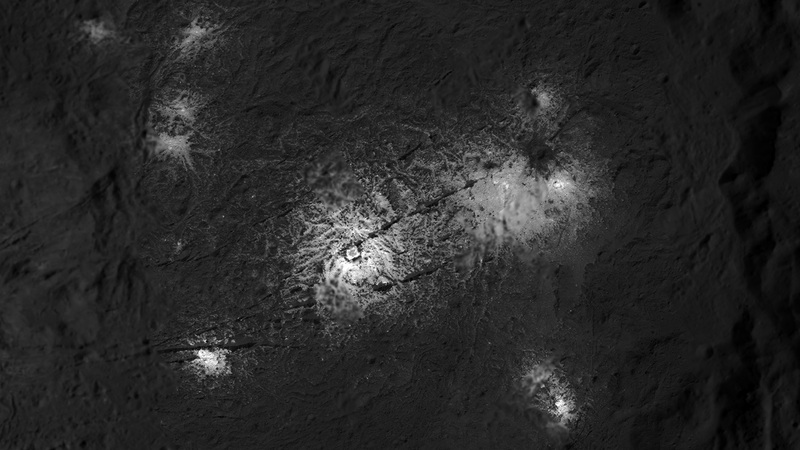 The new study supports earlier interpretations from the Dawn team that this reflective material -- comprising the brightest area on all of Ceres -- is made of carbonate salts, although it did not confirm a particular type of carbonate previously identified. The secondary, smaller bright areas of Occator, called Vinalia Faculae, are comprised of a mixture of carbonates and dark material, the study authors wrote. Dwarf planet Ceres may be hundreds of millions of miles from Jupiter, and even farther from Saturn, but the tremendous influence of gravity from these gas giants has an appreciable effect on Ceres' orientation. In a new study, researchers from NASA's Dawn mission calculate that the axial tilt of Ceres -- the angle at which it spins as it journeys around the sun -- varies widely over the course of about 24,500 years. Astronomers consider this to be a surprisingly short period of time for such dramatic deviations. near the poles, while red indicates lower content at lower latitudes. left by avalanches on Earth. This one also looks similar to TV's Bart Simpson. 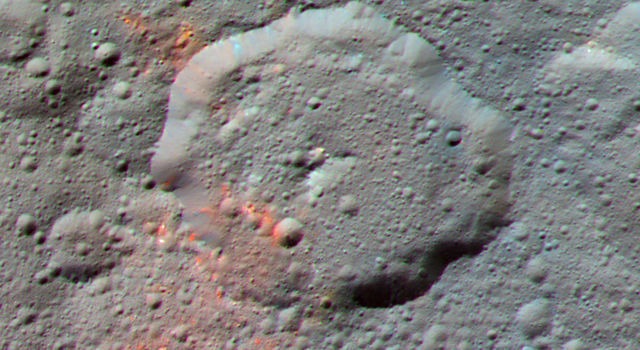 Massive landslides, similar to those found on Earth, are occurring on the asteroid Ceres. That’s according to a new study led by the Georgia Institute of Technology, adding to the growing evidence that Ceres retains a significant amount of water ice. The study is published in the journal Nature Geoscience. It used data from NASA’s Dawn spacecraft to identify three different types of landslides, or flow features, on the Texas-sized asteroid. Last edited by bystander on Thu Apr 20, 2017 3:30 pm, edited 1 time in total. One can still see Homer's fingerprints on Bart's neck from years ago. NASA's Dawn spacecraft successfully observed Ceres at opposition on April 29, taking images from a position exactly between the sun and Ceres’ surface. Mission specialists had carefully maneuvered Dawn into a special orbit so that the spacecraft could view Occator Crater, which contains the brightest area of Ceres, from this new perspective. A new movie shows these opposition images, with contrast enhanced to highlight brightness differences. The bright spots of Occator stand out particularly well on an otherwise relatively bland surface. Dawn took these images from an altitude of about 12,000 miles (20,000 kilometers). 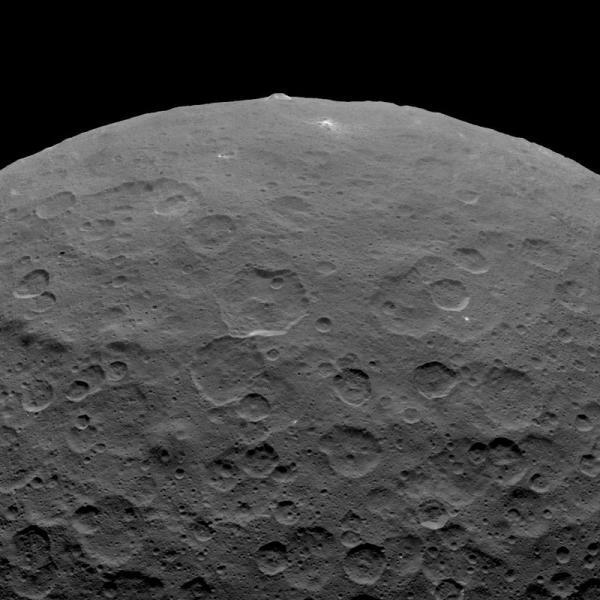 NASA has authorized a second extension of the Dawn mission at Ceres, the largest object in the asteroid belt between Mars and Jupiter. During this extension, the spacecraft will descend to lower altitudes than ever before at the dwarf planet, which it has been orbiting since March 2015. The spacecraft will continue at Ceres for the remainder of its science investigation and will remain in a stable orbit indefinitely after its hydrazine fuel runs out. The Dawn flight team is studying ways to maneuver Dawn into a new elliptical orbit, which may take the spacecraft to less than 120 miles (200 kilometers) from the surface of Ceres at closest approach. Previously, Dawn's lowest altitude was 240 miles (385 kilometers). A priority of the second Ceres mission extension is collecting data with Dawn's gamma ray and neutron spectrometer, which measures the number and energy of gamma rays and neutrons. This information is important for understanding the composition of Ceres' uppermost layer and how much ice it contains. The spacecraft also will take visible-light images of Ceres' surface geology with its camera, as well as measurements of Ceres' mineralogy with its visible and infrared mapping spectrometer. <<Ceres [obliquity/Axial tilt ~4°]follows an orbit between Mars and Jupiter, within the asteroid belt, with a period of 4.6 Earth years. The orbit is moderately inclined (i = 10.6° compared to 7° for Mercury and 17° for Pluto) and moderately eccentric (e = 0.08 compared to 0.09 for Mars). When Ceres has an opposition near the [2.5577 AU : Max surface temperature ~ -38° C] perihelion, it can reach a visual magnitude of +6.7. This is generally regarded as too dim to be seen with the naked eye, but under exceptional viewing conditions a very sharp-sighted person may be able to see it. The only other asteroids that can reach a similarly bright magnitude are 4 Vesta, and, during rare oppositions near perihelion, 2 Pallas and 7 Iris. It can thus be seen with binoculars whenever it is above the horizon of a fully dark sky. 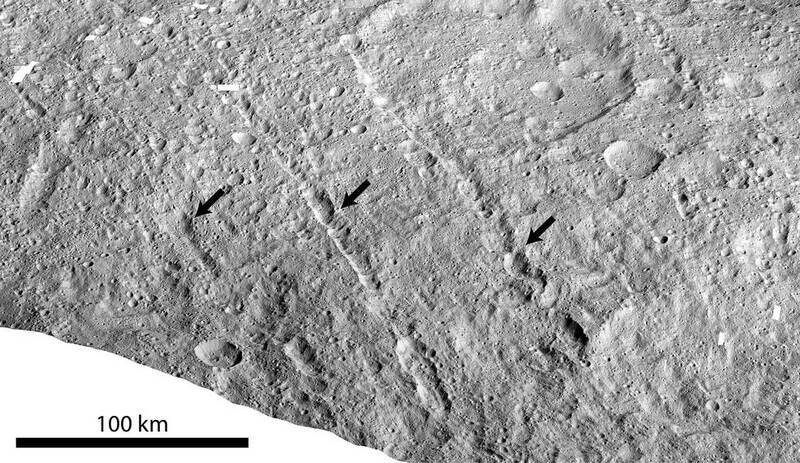 pit chains on dwarf planet Ceres called Samhain Catenae. Surface features on Ceres -- the largest world between Mars and Jupiter -- and its interior evolution have a closer relationship than one might think. A recent study, published in Geophysical Research Letters, analyzed Ceres' surface features to reveal clues about the dwarf planet's interior evolution. 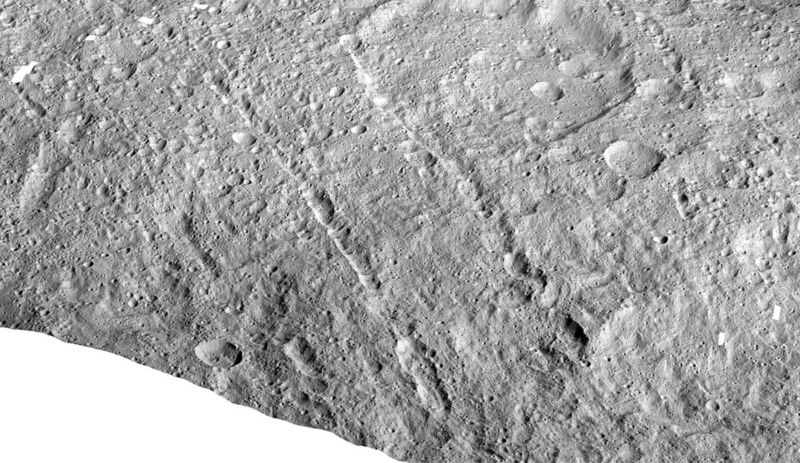 Specifically, the study explored linear features -- the chains of pits and small, secondary craters common on Ceres. The findings align with the idea that, hundreds of millions (up to a billion) years ago, materials beneath Ceres' surface pushed upward toward the exterior, creating fractures in the crust. "As this material moved upward from underneath Ceres' surface, portions of Ceres' outer layer were pulled apart, forming the fractures," said Jennifer Scully, lead study author and associate of the Dawn science team at NASA's Jet Propulsion Laboratory in Pasadena, California. 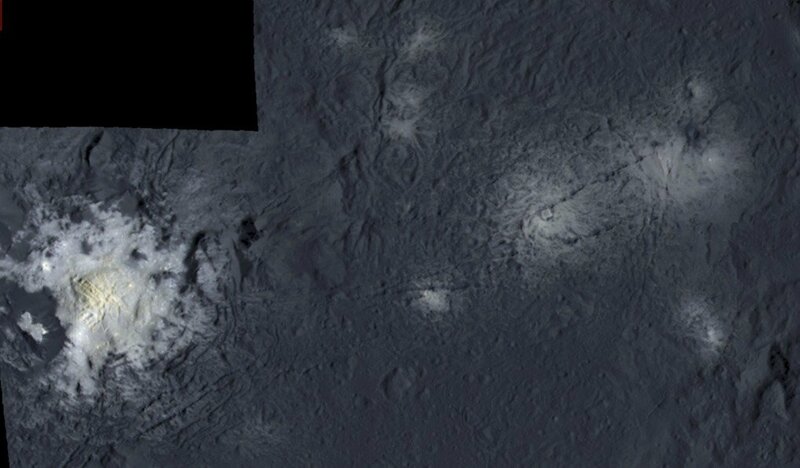 <<The brightest cluster of spots ("Spot 5") is located in an 80-kilometer crater called Occator, which is located at 19.86° N latitude; 238.85 E longitude. The spot in the center of the crater is named Cerealia Facula, and the group of spots to the east - Vinalia Faculae. Alan Duffy of Swinburne University suggested "a meteorite strike either shook covering material off the salty ice or heated it so that salty water rose to the surface as a geyser. The water escaped into space and now, only the salt remains." A haze that fills around half of Occator crater and that does not extend over its rim periodically appears around Spot 5, the best known bright spot, adding credence to the idea that some sort of outgassing or volcanism is occurring. Astronaut photograph ISS052-E-8401 was acquired on June 24, 2017, with a Nikon D4 digital camera using a, 1150 millimeter lens, and is provided by the ISS Crew Earth Observations Facility and the Earth Science and Remote Sensing Unit, Johnson Space Center. The image was taken by a member of the Expedition 52 crew. The image has been cropped and enhanced to improve contrast. Caption by William L. Stefanov, NASA-JSC. <<The scale and form of many impressive features on Earth’s surface can only be fully appreciated through an overhead view. The astronauts onboard the International Space Station may enjoy the best overhead view of all. 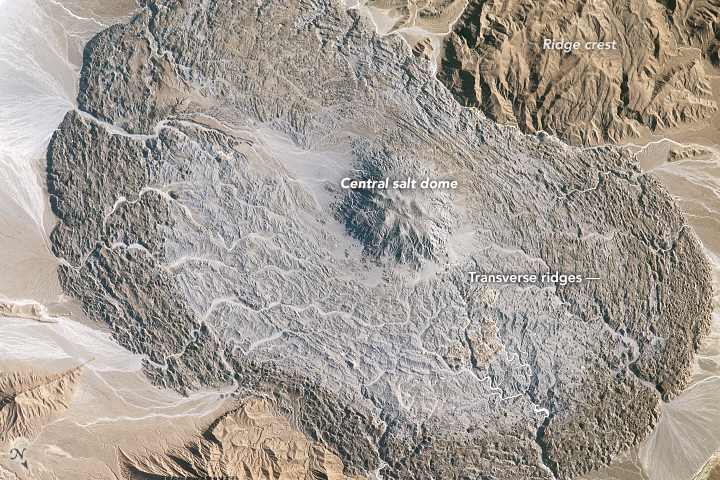 The Zagros Mountains of southeastern Iran are the location of numerous salt domes and salt glaciers, formed as a result of the depositional history and tectonic forces operating in the region. While many of these landscape features are named on maps, the salt glacier in this photograph remains unnamed on global maps and atlases. The vaguely hourglass (or bowtie) shaped morphology of the salt glacier is due to the central location of the salt dome, which formed within the central Zagros ridge crest (top and lower left). Salt extruded from the dome and then flowed downslope into the adjacent valleys. For a sense of scale, the distance across the salt glacier from northwest to southeast is approximately 14 kilometers. More commonly, in the second category, bright material is found on the rims of craters, streaking down toward the floors. Impacting bodies likely exposed bright material that was already in the subsurface or had formed in a previous impact event. Separately, in the third category, bright material can be found in the material ejected when craters were formed. NASA’s Dawn mission has found recently exposed deposits that give us new information on the materials in the crust and how they are changing, according to two papers published March 14 in Science Advances that document the new findings. 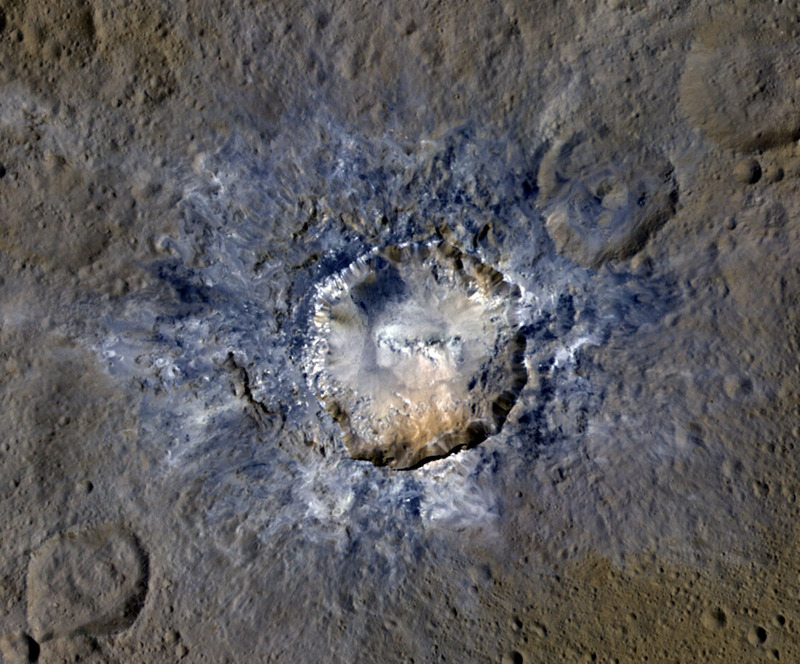 Observations obtained by the visible and infrared mapping spectrometer (VIR) on the Dawn spacecraft previously found water ice in a dozen sites on Ceres. The new study revealed the abundance of ice on the northern wall of Juling Crater, a crater 12 miles (20 kilometers) in diameter. The new observations, conducted from April through October 2016, show an increase in the amount of ice on the crater wall. “This is the first direct detection of change on the surface of Ceres,” said Andrea Raponi of the Institute of Astrophysics and Planetary Science in Rome. NASA’s Dawn spacecraft is maneuvering to its lowest-ever orbit for a close-up examination of the inner solar system’s only dwarf planet. Dawn will collect gamma ray and neutron spectra, which help scientists understand variations in the chemical makeup of Ceres’ uppermost layer. That very low orbit also will garner some of Dawn’s closest images yet. In early June, Dawn will reach its new, final orbit above Ceres. Soon after, it will begin collecting images and other science data from an unprecedented vantage point. This orbit will be less than 50 kilometers above the surface of Ceres -- 10 times closer than the spacecraft has ever been. Dawn will collect gamma ray and neutron spectra, which help scientists understand variations in the chemical makeup of Ceres’ uppermost layer. That very low orbit also will garner some of Dawn’s closest images yet. NASA's Dawn spacecraft reached its lowest-ever and final orbit around dwarf planet Ceres on June 6 and has been returning thousands of stunning images and other data. The flight team maneuvered the spacecraft into an orbit that dives 22 miles (35 kilometers) above the surface of Ceres and viewed Occator Crater, site of the famous bright deposits, and other intriguing regions. In more than three years of orbiting Ceres, Dawn's lowest altitude before this month was 240 miles (385 kilometers), so the data from this current orbit bring the dwarf planet into much sharper focus. Sodium carbonate, Na2CO3, (also known as washing soda, soda ash and soda crystals, and in the monohydrate form as crystal carbonate) is the water-soluble sodium salt of carbonic acid. Pure sodium carbonate is a white, odorless powder that is hygroscopic (absorbs moisture from the air). It has a strongly alkaline taste, and forms a moderately basic solution in water. Sodium carbonate is well known domestically for its everyday use as a water softener. Historically it was extracted from the ashes of plants growing in sodium-rich soils, such as vegetation from the Middle East, kelp from Scotland and seaweed from Spain. Because the ashes of these sodium-rich plants were noticeably different from ashes of timber (used to create potash), they became known as "soda ash". It is synthetically produced in large quantities from salt (sodium chloride) and limestone by a method known as the Solvay process. The manufacture of glass is one of the most important uses of sodium carbonate. Sodium carbonate acts as a flux for silica, lowering the melting point of the mixture to something achievable without special materials. This "soda glass" is mildly water-soluble, so some calcium carbonate is added to the melt mixture to make the glass produced insoluble. This type of glass is known as soda lime glass: "soda" for the sodium carbonate and "lime" for the calcium carbonate. Soda lime glass has been the most common form of glass for centuries. Sodium carbonate is also used as a relatively strong base in various settings. For example, it is used as a pH regulator to maintain stable alkaline conditions necessary for the action of the majority of photographic film developing agents. It acts as an alkali because when dissolved in water, it dissociates into the weak acid: carbonic acid and the strong alkali: sodium hydroxide. This gives sodium carbonate in solution the ability to attack metals such as aluminium with the release of hydrogen gas. "Ashes to crashes, Dawn to dust"
NASA's Dawn mission is drawing to a close after 11 years of breaking new ground in planetary science, gathering breathtaking imagery, and performing unprecedented feats of spacecraft engineering. Dawn's mission was extended several times, outperforming scientists' expectations in its exploration of two planet-like bodies, Ceres and Vesta, that make up 45 percent of the mass of the main asteroid belt. Now the spacecraft is about to run out of a key fuel, hydrazine. When that happens, most likely between mid-September and mid-October, Dawn will lose its ability to communicate with Earth. It will remain in a silent orbit around Ceres for decades. Last edited by bystander on Mon Sep 17, 2018 6:31 pm, edited 1 time in total.